Organic English Wine is our flagship product. Grapes grown in this country may appear disadvantaged by our climate. Indeed they do struggle, but this very difficulty can be turned to advantage by the fact that the long season and slow ripening actually produce grapes of better quality for wine-making. We have chosen hybrid varieties that are best suited for organic growing. These hybrids have been crossed with native American vines, which confer resistance to mildew and so eliminate the need to spray. Uniquely we press our grapes on our old hand-turned cider-press (see logo above) using the ‘straw-cheese’ method which was once traditional for cider-making though is hardly ever used these days. We find that this method works very well with our grapes. Pressing like this is slow and the juice is allowed to oxidise prior to fermentation which then reverses naturally to produce a more stable wine. Seyval is an old, established variety of vine from the Loire Valley. It is widely grown in England, probably doing better here than in its native France. It produces a striking wine of singular freshness and character. As a dry wine it is the perfect complement to any savoury dish from fish or white meat to vegetarian. Orion is a recent, hybrid vine which makes a deliciously fresh and fruity wine with flowery overtones, more typical of its German origin. Sometimes we bottle this wine on its own or we may blend it with the Seyval. Sparkling Wine Using some of our dry Seyval wine, we have made sparkling wine by the traditional ‘Champagne Method’. This involves secondary fermentation in the bottle, followed by a lengthy maturation. The sediment is then riddled into the neck of the bottle and frozen in order to eject it at disgorgement, at which point the traditional champagne cork is inserted and wired on. Unlike champagne, we don’t sweeten our sparkling wine at all. The resulting wine is deliciously dry yet very comfortable to drink. There is an ancient tradition of making wines from a wide variety of fruits, both wild and cultivated. The history of such wines is unrecorded, but they must have originated as fruit-flavoured versions of mead, (known as 'melomels'), since sugar was not available until 200 years ago. Fruit wines may be looked down upon by serious wine connoisseurs, but to the wine-maker they can be just as challenging and satisfying to make. The crucial secret, as with all wine-making, lies in achieving the right 'balance' of acidity and sweetness, so that the true flavour of the fruit comes through. Elderberry Wine (Dry) Full-bodied and fruity - this wine holds its own against any red grape wine.Best served at room temperature. Gooseberry Wine (Dry) Classic gooseberry sharpness with plenty of complexity and fruit. Tayberry Wine (Medium Sweet) Fragrant, delicious and very fruity, this unique wine is particularly good with cheese (even a strong one). Plum Wine (Medium Sweet) Local cherry plums give this wine a rich and spicy balance. Great as an aperitif or party wine. Ginger Wine (Medium Sweet) If you love ginger, you will love this sweet spicy and mellow wine for after dinner. Blackberry Wine (Medium Sweet) Fruity and evocative of autumnal hedgerows. Raspberry Wine (Medium Sweet) Lush and so easy to drink - Party time! Mead is almost certainly the most ancient of all alcoholic drinks, possibly dating back some 12,000 years. It is very simply made from honey, diluted and then allowed to ferment. It crops up in many cultures across the world and throughout history. It would have pre-dated even wine and beer, which can be traced back several thousand years. The tradition of mead in Europe was pursued most in areas less suitable for wine grapes, which explains the enthusiasm of the Vikings for mead. England has a long history of making mead, although it is not well-recorded. The monasteries were skilled in keeping bees and brewing. After the dissolution of the monasteries, these skills became scattered and only survived thanks to individuals pursuing a cottage industry. Honey production has always been scattered and small scale, so mead never lent itself to industrial scale production. Although English honey is of excellent quality, it is difficult to produce on a large scale because of our unpredictable climate and problems with disease. It is almost impossible to produce organic honey in England, (or anywhere in Europe for that matter), because you can't get your bees out of flying range, (3 miles), of conventional agriculture. For our organic mead, we use organic honey imported from Brazil. It is cheaper because the bees don't have to stop work for winter - there are flowers all year round! It is good to encourage organic production abroad, because it gives other countries an alternative and an incentive to resist the aggressive marketing of agrochemicals and GM crops. So, the more organic products we buy, the more land is cared for by traditional methods, which have proven sustainability. Pure Honey Mead (Medium Sweet) The honey is simply diluted with water, fermented and then sweetened with more honey before filtration and bottling. The mead takes its rich golden hue from the organic honey. It has just sufficient sweetness to bring out the full flavour of the honey, but has a light, lemony finish, which has you reaching for another sip. It is certainly our best selling product. Apple Mead (Medium Sweet) We dissolve organic honey in our organic apple juice and then ferment and sweeten with more honey, filter and bottle as above. This is the mead that we fortify to make the Mead Liqueur, which lives up to its epithet, ‘Nectar of the Gods’. 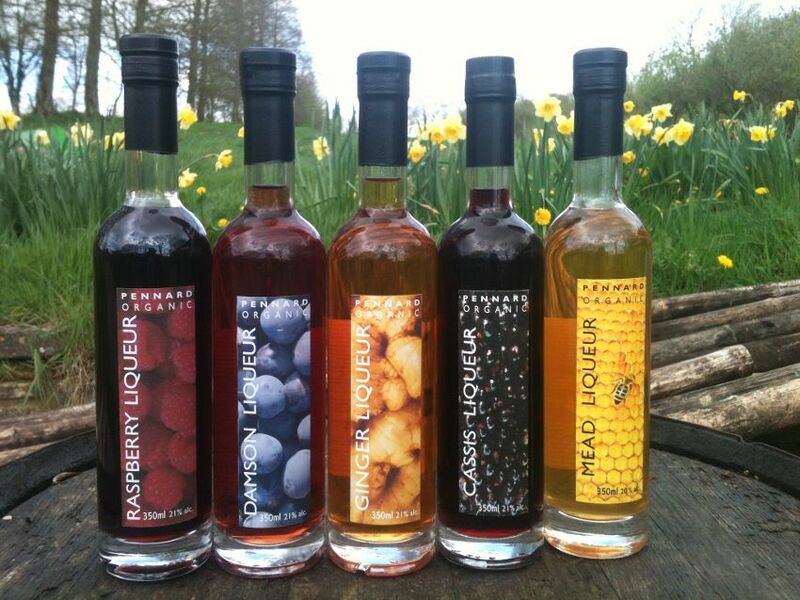 Our range of liqueurs has mainly developed from the existing fruit wines and mead. The aim has been to achieve the most intense flavour and taste sensation possible. The technique involves extremely high concentrations of fruit which is macerated and fermented, often to quite high levels of alcohol. Then the pressed out wine is fortified with extremely strong (96%) alcohol to reach about 21% abv and sweetened to balance. The taste is simply stunning and hard to resist…..
Raspberry Liqueur This is the most intense raspberry taste that you are likely to experience. Most people say “Wow!”. Damson Liqueur A dead ringer for Sloe Gin! Spirited and fruity with a hint of almond. Ginger Liqueur This trumps the Ginger Wine for those ginger-lovers out there! Cassis Liqueur A serious rival to the French version, but try sipping instead of mixing Kir! Mead Liqueur This has got to be the ‘Nectar of the Gods’. This is the ultimate mead. Personally, I encourage customers to sip and savour from a tiny glass. Less is more! A small sip on the tip of your tongue is very impressive compared to a gulp or shot! However, cocktails are very fashionable and our liqueurs are great for mixing too, so do experiment! Also the liqueurs are great drizzled over puddings and ice-cream. We planted our cider orchard in 1987 with traditional old varieties (Harry Masters Jersey, Stoke Red, Sweet Coppin, Yarlington Mill, Dabinett and Dunkerton’s Late Sweet). When blended together these apples make an excellent cider. The cider apples are allowed to fall when they are naturally ripe and are then picked up and when we have about a ton of apples we start to mill them. The apple pulp is shovelled onto a layer of straw on the bed of the old cider-press and is covered with more straw. In this way alternate layers of straw and apple pulp are built up to form the ‘straw-cheese’, until no more fits on the press. The straw holds the fruit in place and allows the juice to filter through. A good deal of juice runs out whilst the straw is being built. A slab of wood, called the ‘follower’, is placed on top of the cheese, with stout baulks of timber to transmit the pressure as the press is wound down. As the juice runs out into a trough, it is pumped away into a fermentation vat, where it is simply left. The juice ferments naturally and literally “makes itself” into cider. The straw in the spent ‘pomace’ makes it perfect for composting. The resulting cider is traditional farmhouse ‘scrumpy’, typically somewhat cloudy as it is unfiltered. We sweeten some of it to give customers the option of dry, medium or sweet. The cider is only available in our farm shop. It is even cheaper if you bring your own container.